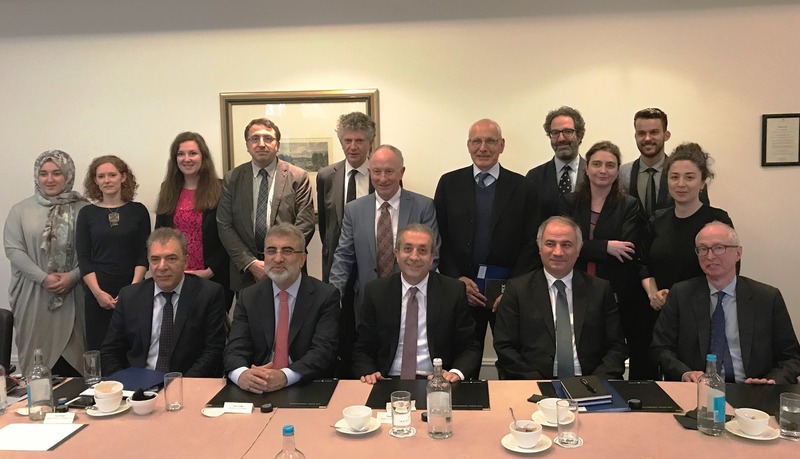 On April 11, DPI hosted three representatives of the Turkish Justice and Development Party (AKP). AK Party Deputy Chairman Mehmet Mehdi Eker, Efkan Ala (MP, Member the Central Decision and Executive Board of AK Party and former Minister of Interior) and Taner Yıldız (MP, Former Minister of Energy and Natural Resources) met with DPI advisors and international senior experts in the field of conflict resolution at a venue in Westminster, London. The meeting provided a fruitful discussion and participants were able to hear the delegation’s view on the current situation in Turkey as well as the wider region. International experts including Jonathan Powell (Former Chief of Staff to Tony Blair), Dermot Ahern (Former Irish Minister of Foreign Affairs) and Sir Bill Jeffrey (Former Political Director of the Northern Ireland Officer) shared their international experiences in terms of conflict resolution which was met with great interest and led to a constructive exchange of opinions.